Life-Skills, Empowerment, And Development Services (LEADS) announced that tickets are now available for their upcoming The Cotton Club fundraiser event at Gulfport Casino on February 22nd. The non-profit organization offers parenting classes at schools, in churches and pediatric clinics in Pinellas County. Life-Skills, Empowerment, And Development Services (LEADS), a Pinellas County, Florida based non-profit organization, announced that tickets are now available for their upcoming Cotton Club event at the Gulfport Casino on February 22nd. The non-profit is dedicated to helping families with children prenatal to 18 years through educational programs that prevent, reduce, and treat behavioral and emotional problems, as well as risk-taking behaviors. 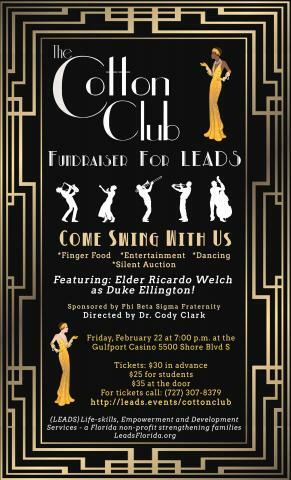 More information can be found at http://leads.events/cottonclub. The event starts at 7:00 p.m., Friday, February 22, at the Gulfport Casino. Located at 5500 Shore Blvd. S. The Casino itself is an historic ballroom where big bands drew huge crowds to Florida’s west coast in the 1930s and 1940s. The beautiful waterfront location is the perfect spot for The Cotton Club fundraiser featuring Elder Ricardo Welch as Duke Ellington. Guests are invited to swing the night away with great food, fun, and friends. They can dance, snap a selfie at the photo booth, or simply enjoy the show directed by Dr. Cody Clark, all while helping to support the children and families of Pinellas County. Dance clubs that fill a table of 10 attendees will also have an opportunity to highlight their club and do a dance as the only dancers on the floor. All those attending The Cotton Club are cordially invited to dress in costumes of the era, such as flapper dresses, feathered boas, elegant clothes, mobster suits, spats or art deco fashions. Although these costumes are welcome, they are definitely not required. Tickets for The Cotton Club are $30.00 in advance, $25.00 for military and students with identification, and $35.00 at the door. The recent announcement is part of LEADS’ commitment to continue offering free parenting classes at schools, in churches and pediatric clinics. Their programs aim foster parents’ ability to promote children’s social, emotional and language development. Interested parties can find more by visiting the above-mentioned website and https://leadsflorida.org or calling The Cotton Club fund-raiser, Vicki Draeger, at (727)307-8379.